HOUSTON, TX (August 12, 2014) H-E-B's Primo Picks: Quest for Texas Best contest has made one thing very clear: Texans love sweet and spice. Blend those flavors, and they are irresistible. The combination caught judges' taste buds as they whittled nearly 600 submissions from across the Lone Star State to 25 exceptional finalists. 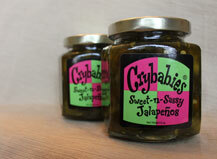 Get a taste of Crybabies Sweet-N-Sassy jalapeno and it's hard to eat just one. This yummy delicacy is the brainchild of local residents Virginia Ellis and Tracy Sage. Both stay-at-home moms who share a love for cooking. 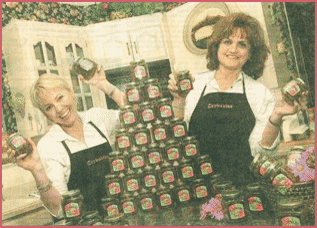 Virginia and Tracy worked hard creating a unique recipe for the sweet, spicy treat as well as an unforgettable name for their product. Friends for over a decade, the two spent many hours brainstorming ways to tap into their creative and culinary skills. Once they decided on the product and name, the next learning curve was meeting FDA requirements, plus getting their business license and company paperwork in order. In addition, they sent their finished product to Texas A&M University to have it analyzed for nutritional content and shelf life. 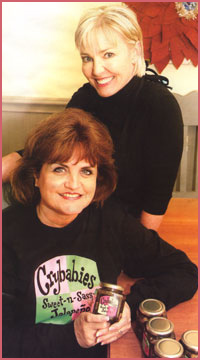 Crybabies hit the shelves for the first time just before May 5, 2005, Virginia said. Just recently, the partners took the company public. "Crybabies are on the menu at George's Restaurant in Waco and also at Hewitt's Rosati's Pizza," Tracy said. "Businesses and people in the community have been unbelievably supportive and receptive to our product. We couldn't have done it without their encouragement." Tracy and Virginia each have a teaching degree from Baylor University and three kids. The partners still make the products themselves at a local commercial kitchen and love reading the comments they receive on their website. Crybabies are sold online and also locally at Spice, Jan's Perfect Presents, Carol & Co., Lane's on Austin, Dicorte's, Honeybee Ham and Rosati's Pizza as well as other locations throughout Texas. The company ships Crybabies all over the United States and has even received orders from Japan. When McGregor moms Tracy Sage and Virginia Ellis started playing around with the idea of bottling their opwn "sweet and sassy" jalapeno recipe about two years ago, they tried on a lot of names. "I really wanted to call 'em 'Slap your Pappy' peppers," recalled Sage, 45. "But when Virginia hit upon 'Crybabies' instead, I knew we had it!" Crybabies hit the shelves in time for Cinco de Mayo 2005. The product, they claim, boosts a recipe that keeps the bite of a flaming jalapeno but balances it with the sweet tang of pineapple. In their research, they found other chefs had mixed jalapenos with cherries, peaches, or strawberries, but nothing like theirs, Sage said. "We knew what we liked, and what our friends liked," said Ellis, 47. "We're just two middle-aged gals who like messing around with recipes." But putting their product up for sale was a bigger endeavor than they had suspected. "We didn't know what all would be involved when we first started this," said Ellis. We thought you just cooked it up and bottled it, slapped a label on it and sold it. But that (Food and Drug Administration) is so picky!" They lined up a commercial kitchen to use in Crawford, where they go twice a month (or more often, if need be) and prepare 120 jars of their concoction each time. A friend helped them design their labels. Besides the business license and company paperwok, Ellis and Sage had to send the product off to Texas A&M University to have its nutritional content analyzed for the back label and to have its shelf life determined. In Waco, Crybabies products are available at HoneyBee Ham & Deli, Uncle Dan's Rib House, Jan's Perfect Presents, Carol & Co., Spice and Texas Tasty Treats. In Temple, they can be found at Las Casas. They also are sold at the Red Bull in Crawford and in Gatesville at Swindoll's and Charisma Salon.They also are found in Salado, Dallas and Richardson. Ellis and Sage are tickled to be included on the menu at Rosati's Authentic Chicago Pizza in Hewitt, where Crybabies is a specialty topping. Plus, the two women have had orders from California, Mississippi, Minnesota, Colorado, Oklahoma, and even Japan - from people who had received jars to try from friends. Crybabies are even headed to Iraq in the care packages local families send to their military kinfolk, Ellis said. Both women are former teachers who earned bachelor of education degrees at Baylor University. Sage received hers in 1983, and Ellis in 1999. They've known each other for 12 years, "and after all this we're still friends," Ellis said. Ellis works with graduate students on their scholarships at the business school at Baylor. She is married to Joe Ellis, owner of Harris Creek Trees. They have three children. Sage, a homemaker, is married to Randy Sage, a broker for A.G. Edwards. They have three children as well. Other than saying they've had "wonderful local support" for Crybabies, the women declined to disclose their earnings on this enterprise. "I will say that we didn't take out loans to do this. We dug into our own pocketbooks," Ellis said. Earnings have far surpassed what they expected to earn, especially in the beginning, she added.